As many may remember during the 2017 River Days Festival, the day the headlining act was scheduled to perform was wet and cold. Even forgetting that the headliners never showed due to an illness, most people probably would not want a repeat of last year’s rain. However, one young lady from Valley High School in Lucasville may be wishing for a bit of precipitation during this year’s celebration. 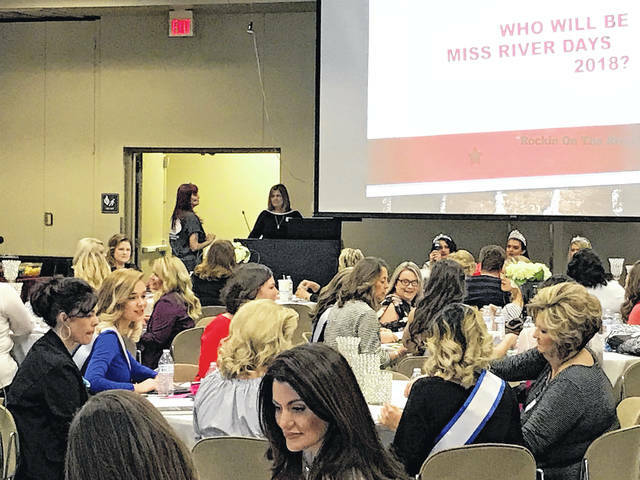 On Sunday, River Days pageant organizers held an informational session for 12 young ladies, each representing a local high school, taking part in this year’s festival pageant. That number included Shelby Altman-Metzler, a Valley High junior. 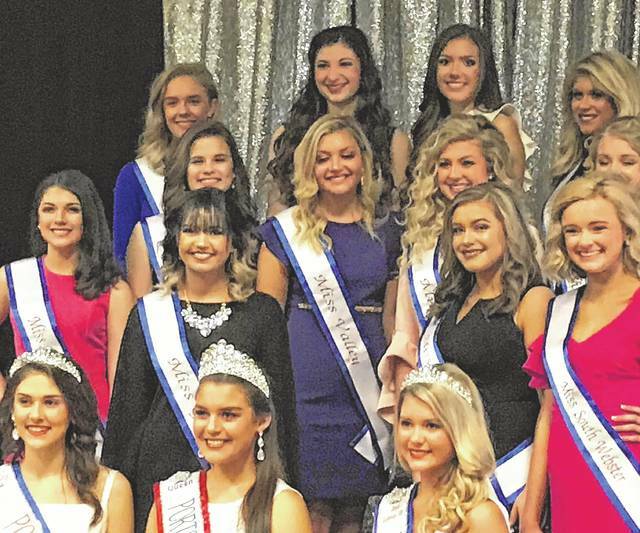 Last year’s Valley representative ultimately became Miss River Days 2017. Now a senior, Kennedy McGraw, 18, said three girls from Valley have won the pageant. She added that each time a Valley representative won, it rained. River Days always begins on the Thursday prior to Labor Day, meaning the 2018 festivities launch Aug. 30. The annual pageant is slated for Sept. 1 at the Vern Riffe Center for the Arts at Shawnee State University. The beginning of pageant judging could be said to be during the Grand Parade, which steps off at 11a.m. that day. Each pageant contestant will have a float in the parade, designed and created by the contestants. The theme for this year’s festival is “Rockin’ on the River,” says Lori Lowe, pageant director. Accordingly, each pageant float will invoke some type of music ranging from opera to rap. Contestants were randomly assigned a genre of music. In talking about the floats, Lowe gave the girls, their mothers — and, in a few cases, their fathers — as well as their “pageant mothers,” a few pieces of advice. Firstly, she said, while parents can help, contestants should work on the floats themselves. The out-of-town judges will be asking questions about the floats, she said, and they won’t want to talk to the parents. While contestants wear assigned outfits during the parade, they must pick an evening gown for that night’s evening gown competition. Once chosen, gowns must be registered at a local store to ensure there is no duplication of dresses. Lowe stressed the importance of the evening gown competition. “This is your big moment,” Lowe said. However, judging from comments she made later, contestants may want to pay a lot of attention to the interview portion of the pageant. Each girl will be interviewed by a panel of judges for 5 to 10 minutes. Lowe said if a contestant impresses judges during the interview, you can bet they will be paying attention to the contestant during other portions of the contest. “The interview is critical,” Lowe continued, advising contestants, their moms and pageant moms to begin practicing for those interviews now. “Don’t wait,” she cautioned. Incidentally, “pageant moms” are volunteers who help contestants before and during the pageant. One important point of the recent information session was to let contestants know of their responsibilities during the months leading up to River Days. Each girl must put together a community service project and must pay attention to the projects of other contestants. Last year, McGraw’s project revolved around fitness and a healthy lifestyle. She held the first of what has become an annual event known as Friday Night Lights, which promotes healthy snacks, exercise and so on. “It was easily one of the best experiences of my school days,” she said. For the future, McGraw will attend Marshall University, majoring in political science, and possibly go to law school. Among the attendees at Sunday’s event was Ally Smith, 16, this year’s representative from Clay High School in Clay Township. Smith said she was even excited about the informational meeting. “This means we’re really beginning to start this journey,” she said. While the pageant is one of the highlights, the annual extravaganza is often defined by the musical groups that play along the Ohio River. Lowe said what entertainment is coming to River Days always garners a lot of interest from the public. She said she knows what local and national acts the festival committee is trying to ink, but is not allowed to release that information just yet. Teresa Bratton, a member of the River Days committee, said in a phone interview an announcement regarding festival entertainment is due in the spring or early summer.